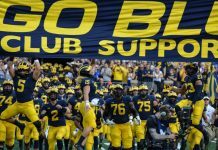 The Michigan Wolverines got the train back on the tracks Saturday against Rutgers University on Homecoming weekend as the Wolverines won 35-14. 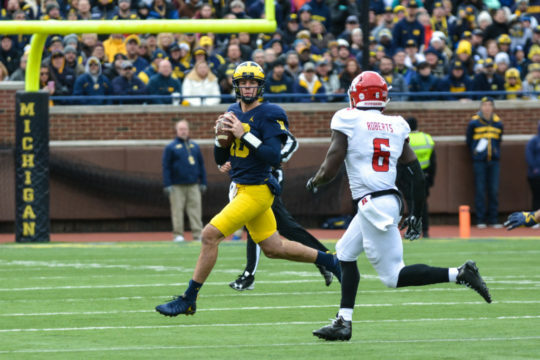 Redshirt freshman quarterback Brandon Peters led Michigan to a victory while taking his first meaningful snaps with the Wolverines..
Senior John O’Korn started the game but was pulled early after he threw for 13 yards and an interception in the beginning of the game. O’Korn also had two fumbles in the game, both recovered by him. During the second quarter the Michigan crowd erupted in applause and cheering as the video board showed Brandon Peters running on the field. Coach Jim Harbaugh after the game said the move was planned. 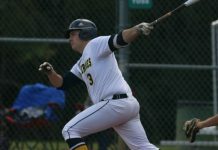 “We told the whole team during the Monday meeting Brandon would play, and play early in the game,” he said. Peters made his presence felt immediately when he drove the team down the field in 13 plays of 80 yards, resulting in a Khalid Hill touchdown. The next drive for the Wolverines resulted in an eight-play drive of 77 yards and a Karan Higdon 10 yard touchdown run, putting the Wolverines up 14-7. Peters was not finished in the second quarter, though, as he and the team got one more chance before halftime. They made the most of it with a seven-play drive of 49 yards and a Chris Evans reception of 20 yards for a touchdown. The touchdown pass was the first of Peters’ career. The Scarlet Knights of Rutgers did not roll over, though, as they scored a touchdown in the second quarter as running back Janarion Grant rumbled for a 65 yard scramble. They also scored a two-yard touchdown in the third quarter by running back Gus Edwards. Michigan, however, did not let their foot off the gas as running back Kareem Walker got his first touchdown for the Wolverines on a five yard run in the third quarter. Finally, in the fourth quarter the Wolverines, led by Peters, had a two play drive of 61 yards capped off by a 49 yard run by Karan Higdon for a touchdown. Peters said nerves were not a factor heading into the contest. “I was not that nervous, very excited,” he said. 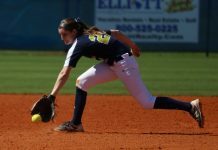 “Coach told me to work on my communication skills, and I had gotten better every day since camp. Peters ended his first day as the Michigan quarterback with 124 yards and 10 completions on 14 attempts. He also had a touchdown. Peters earned the approval of his teammates after his big performance. “Brandon has a great attitude and does not panic, and that is a big time accomplishment,” said running back Karan Higdon. Higdon, himself, had another big day on the ground. He ended his monster day with 158 yards and two touchdowns. Ty Isaac had 109 yards of his own. This game also saw the emergence of Kareem Walker with 34 yards and a touchdown run. The Michigan offense gained 471 yards and 5 touchdowns for this game. Rutgers only achieved 195 yards and two touchdowns. Harbaugh said he was impressed with Peters’ performance. 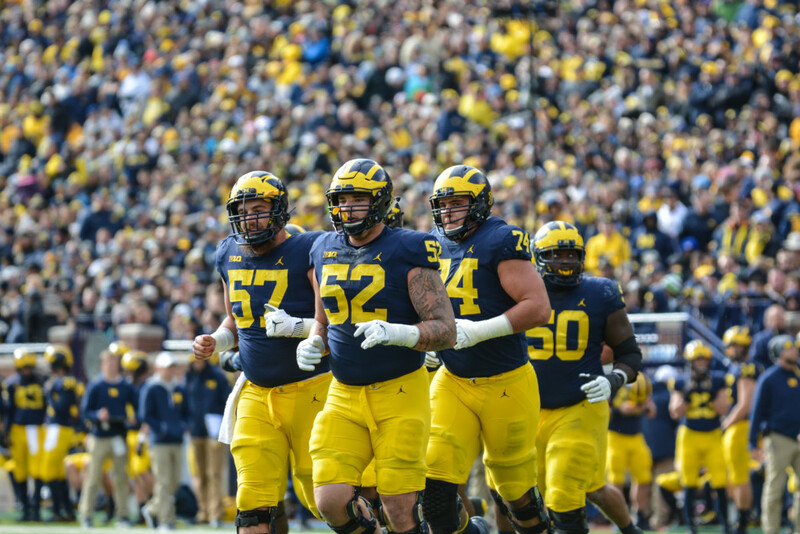 “I thought he (Peters) was ready, base that mostly on practice and his consistently moving the team.” Harbaugh said. “He acquitted himself well, played very well. However, Harbaugh fell short of naming Peters the starter. “I will not name a starter for next week yet but Brandon has earned the right to be in the conversation,” he said. 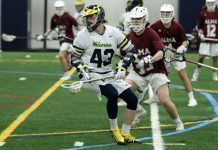 Michigan next plays Minnesota at the Big House on Saturday night at 7:30. This is the second night game this season against a Big Ten team. Michigan is now 6-2 and Minnesota is 4-4 and looking to right the ship they are rowing.